Any musician that has been using an iOS device is most likely familiar with Positive Grid. Their JamUp, BIAS and Final Touch applications have pretty much taken the iOS music world by storm. BIAS has been so popular with guitar players that Positive Grid have decided to enter the desktop market with BIAS Desktop. I have previously reviewed and loved both JamUp Pro and BIAS on the iPhone, and have started using Final Touch on my iPad Mini. As soon as I heard BIAS was coming to the desktop world I jumped at the opportunity to test it out. I am testing BIAS Desktop on my Intel Core 2 Quad Q6600 desktop computer, loaded up with 4GB DDR2 RAM, SSD drive and running Windows 7 64 bit. Where BIAS in the iOS environment can be run as a standalone application, BIAS Desktop can only be run inside a DAW. For this purpose I have been using Reaper. My instrument interface is an M-Audio Fast Track USB. Getting BIAS loaded was a simple affair of adding a new virtual instrument, selecting BIAS Desktop and then setting my channels to a MONO one to use with my instrument interface. My computer system is six years old now, and has no issues running multiple instances of BIAS Desktop, alongside other VSTs such as EZDrummer and various effects. Anyone familiar with the iOS version of BIAS will feel at home with the desktop version. The screens are pretty much identical, which is a good thing as the presentation looks brilliant. The way you interact with BIAS is pretty much the same, bar the fact that you use a mouse – unless you have a touchscreen. Using the mouse is a little more finicky than touchscreen, but it’s not too difficult. The tones available in BIAS, just like the iOS version, are fantastic and just as flexible. Anything that can be done in the iOS version is also possible in the Desktop version. Tone Cloud is available too, so all of the community created tones, as well as purchasable expansion packs are all available to desktop users. All of the features from the iOS version are ported over to the desktop version. That will most likely be plenty for most people, but Positive Grid have taken the Desktop version to the next level and added amp matching capabilities. That’s right – BIAS Desktop is ready to compete with the Kemper profiling amplifier, at a price point far more attractive to players! The amp matching technology is nice and easy to use, and only limited to your amp and microphone collection. First find a virtual amp that sound’s pretty close to the amplifier you wish to match. Record a sample, then move on to recording the sample of your mic-ed amplifier. 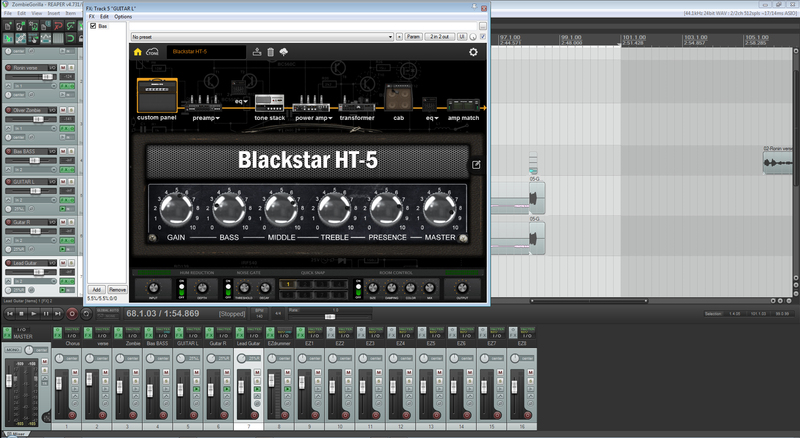 BIAS then does a little magic and presto, you have a virtual version of your amplifier. Tweak the settings to get as close as you can or want, or improve it even further from there. Overall Positive Grid BIAS Desktop is a game changer. If Positive Grid just ported the iOS application over to PCs they would be onto a winner, but the addition of the amp matcher just takes BIAS Desktop to the next level. If you are looking to move into computer based amp sims for recording, or just adding to an established collection you cannot look past BIAS Desktop. It will literally change how you look at and listen to software based guitar tones. Here are a couple of my recent pickup demos, utilising BIAS Desktop as my amplifier. This demo is using the “Sabbath” amplifier, downloadable through Tone Cloud.